A comfortable win for Millwall against the Championship's bottom side. 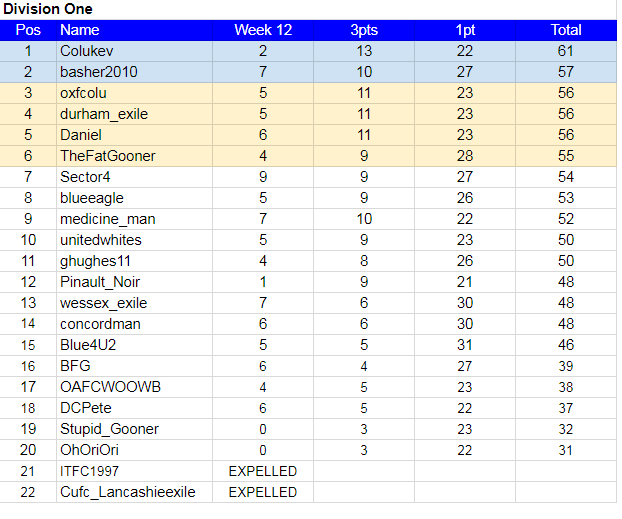 Well done to TheHappyGooner for being the only one to get this spot-on, though 22 did have the outcome, with 10 going for a 2-1, in what was the weeks most predicted result. Fleetwood beat Blackpool in the league for the first time, and bring an end to their eleven match unbeaten run. Nobody had this spot-on, but 12 did get the the outcome. Oxford United celebrated their 125th anniversary with their biggest league win of the season, and stretched their unbeaten run to five games. Again nobody got this spot-on, though 14 did have the outcome. Cheltenham are now without a victory in eight matches after this defeat. A decent 8 had this spot-on, with a further 14 getting the outcome. Crewe bring an end to Grimsby's four match unbeaten run where they had four clean sheets. A very decent 9 got this spot-on, and another 10 had the outcome. League Two's two meanest defences had to settle for a draw that means both teams have still only lost once in the league. A very good 7 had this spot-on, and 2 more got the outcome. With Millwall, Fleetwood and Oxford all scoring 3 in their wins, it was always going to prove difficult to find 3 pointers from those games, but the 24 from the other three games more than made up for that shortfall, and we ended having our best six game week of the season so far. There were five members who managed to have two spot-ons, with the best being Sector4 who had the Crewe 2-0 and the Mansfield 1-1, and with three outcomes, he is the weeks top scorer with an excellent 9 points. Those same two spot-ons were also achieved by thrillseeker, on his way to a decent 8 points. Also with a decent 8 points was gerry_us thanks to having the 2-0 wins for Crewe and Stevenage spot-on. By having those 2-0 wins spot-on as well medicine_man got a very good 7 points. The other member to get two spot-on was wessex_exile, the Stevenage 2-0 and the Mansfield 1-1, to also give him a very good 7 points. That same points total was also achieved by basher2010, who came out best of those who had one 3 pointer, as he was another to benefit from having the Stevenage 2-0 spot-on. The groups for the Happy Cup have been drawn, and the fixtures for Round 1 are ready for predicting. All details can be found on the Happy Cup thread. In the Premier Five outcomes for sevebalo made sure he maintained his two point lead, as RSCOSWORTH achieved the same total thanks to having the Mansfield 1-1 spot-on. The decent week for gerry_us moved him back into the final Charity Shield spot. After Week 9 eagledares found himself bottom, but another solid week moves him up another two places into fourth. Also up two places, and out of the relegation zone, is thrillseeker who is starting to show the form that won him the title last season, as he made it five 3 pointers from the last three weeks. Even though they were the only ones to get the Millwall 3-0 spot-on TheHappyGooner now find themselves 8 points from safety. In Division One Just two outcomes for the second week running means the Colukev 8 point lead is cut in half, as the pack continue to close. Up four places into the other automatic spot is baser2010, who is back showing the kind of form that saw him leading Division One for a long time two seasons ago. The next three places can only be separated by the first to post rule, as this league is promising to be every bit as close as last season. Biggest mover this week is Sector4, with his top scoring effort taking him up five places, and just a point from the play-offs. By making it four 3 pointers from the last two weeks medicine_man must be taking some particularly potent potions that he hopes will last him beyond halloween. By predicting last weeks fixtures again Stupid_Gooner lived up to his name. Week 13 Fixtures picked by this weeks guest TheHappyGooner. Please can OriOri have the 2-1 predictions for these if he is unable to post. Poll: How many polls will Leadbelly do this season?